Tornadoes are nature's most violent storms. They are rotating, funnel-shaped clouds that extend from a thunderstorm to the ground. Their whirling winds can reach 300 miles per hour. They can strike quickly with little or no warning, devastate a neighborhood in seconds, and leave a path of damage over a mile wide and 50 miles long. 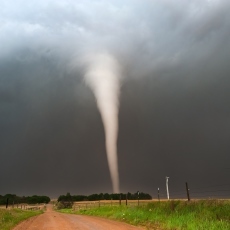 Tornadoes can also accompany tropical storms and hurricanes as they move onto land. Although there are no guarantees of safety during a tornado, you can take actions to protect yourself. You should have a disaster plan. Being prepared can help reduce fear, anxiety, and losses. If you do experience a disaster, it is normal to feel stressed. You may need help in finding ways to cope.